Avoid wearing man made fibers and bring a bottle of water with you to class. All glass classes take place at the Worcester Center for Crafts' New Street Glass Studio, 35B New Street, Worcester, MA 01605. Final pieces will need time to cool and will generally be ready for student pick-up at the Glass Studio starting the Monday or Tuesday following your workshop. General open hours at the studio are Monday through Friday, 10-6PM, though it is recommended that students call the studio directly at 508-757-1424 to confirm open hours for pick-up prior to visiting. Get a taste of the ancient art of glassblowing in this fun one-night course. 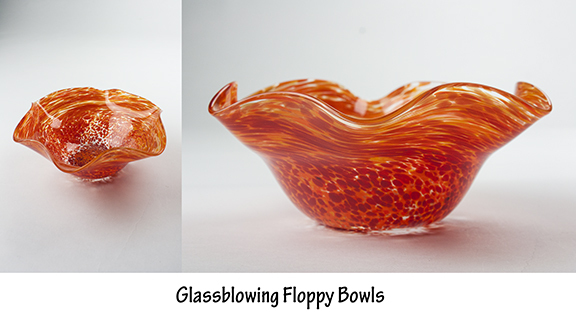 In one evening, you will learn about the history and process behind creating beautiful blown glass at the New Street Glass Studio. After learning the safety and studio etiquette rules, students will watch a brief demonstration of this 2000-year-old art before diving in and making their very own floppy bowl from glass gathered out of a 2100-degree furnace. Students will choose their own colors and instructors will guide the class through the steps from gathering to applying colors, to blowing out the bubble, to spinning it open to create each unique floppy shape. No experience is necessary and all materials are included. A refund is given upon request in writing at least two business days prior to first class meeting. No refunds or credits are given for student absences. The Worcester Center for Crafts generally follows the Worcester State University inclement weather policy relative to building closing and class cancellations, however there are times that evening classes, and weekend workshops differ from the Worcester State University weather policies. Click here for cancelations The Worcester Center for Crafts schedules make-up classes when possible for sequential classes.